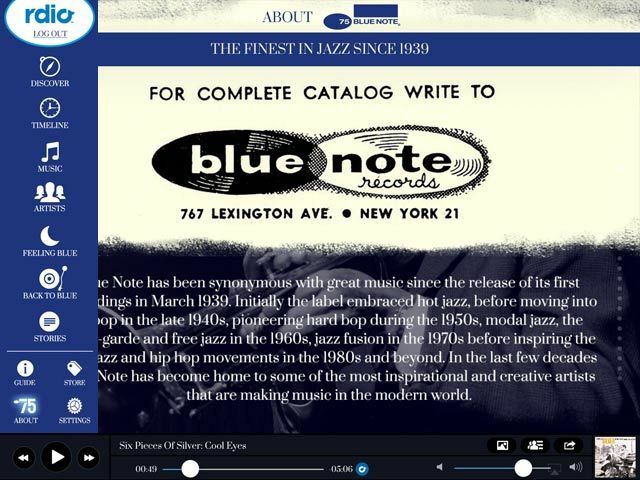 Legendary jazz label Blue Note invites you to celebrate its 75th anniversary by downloading the free multimedia iPad app, Blue Note 75. If you’re a serious student and lover of jazz, you’re probably already very familiar with many of the renowned artists Blue Note helped created — from jazz pianist, Thelonious Monk; the legendary trumpeter Miles Davis, and saxophonist, John Coltrane; to the contemporary jazz music of Robert Glasper, Gregory Porter and Nora Jones. The world of Blue Note is huge, and there’s no better way to tour its vast jazz catalogue than by downloading Blue Note 75. 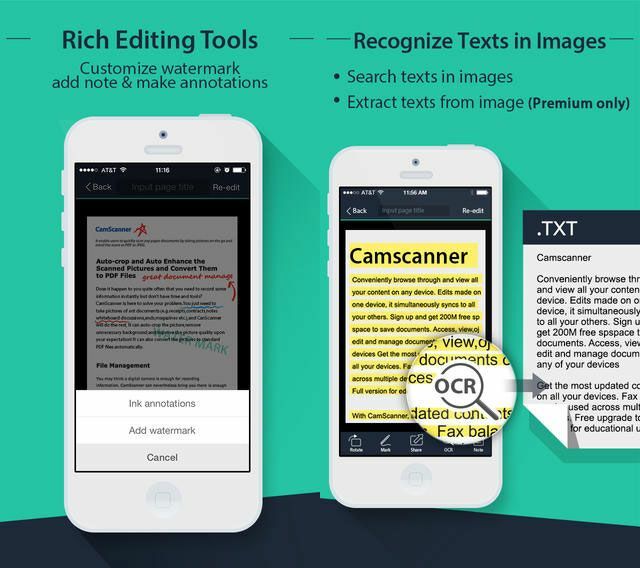 Blue Note 75, which is similar to Ken Burn’s iPad of legendary documentaries, packs a lot of content for a free app. 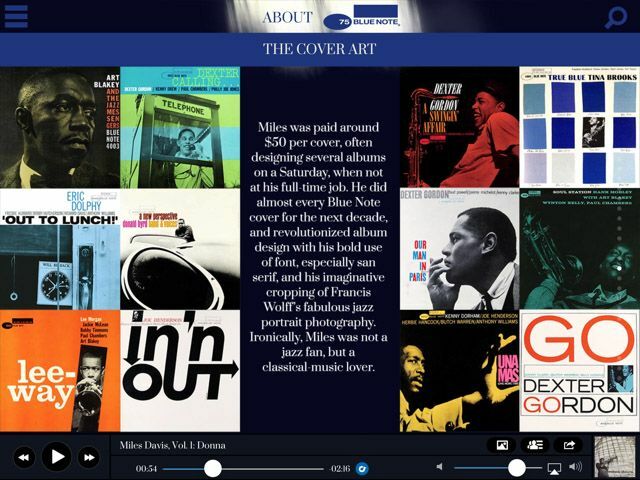 Its slide-out menu links to a timeline of Blue Note’s history (starting with the release of its first recording in 1939), a large selection of albums to stream, a catalogue of all its artists, and a collection of feature stories and news items about past and current artists. Dig this: if you’re a premium subscriber to a music streaming site like Spotify, Rdio or Deezer, you can listen to the music selections 0n Blue Note 75 in their entirety. The app even plays in the background. 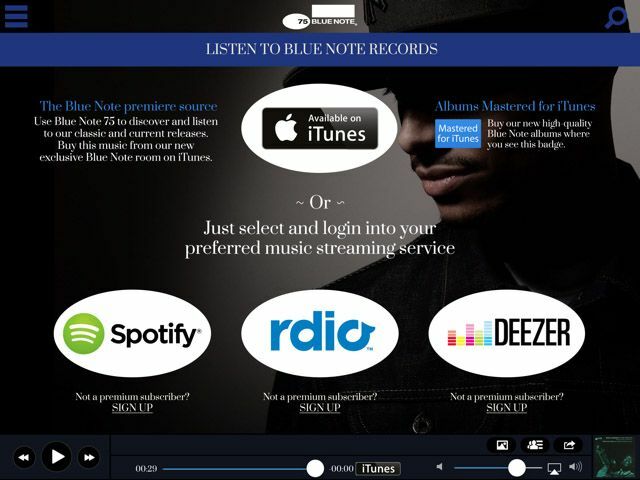 And of course, you can purchase downloads of Blue Note’s classic and current releases from the iTunes Music Store. You can read short bios of the artists as you listen their music, check out their other Blue Note releases, as well as browse a list of similar artists. Another reason for Blue Note’s legendary status is due to the label’s classic vinyl album covers, most of which were designed (from 1955 onwards) by a 28 year-old artist named Reid Miles. Reid revolutionized album designs with his choice of fonts and imaginative cropping of portrait photos taken by Blue Note co-owner, Francis Wolff. You can view a collection of over 400 covers in a book titled, The Cover Art of Blue Note Records, by Graham Marsh and Glyn Callignham. 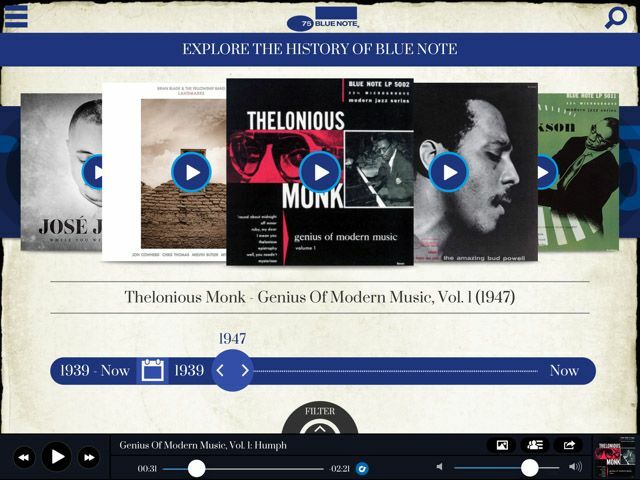 If you want to explore the history of the Blue Note label, you might first want to start by checking out the selected albums in the timeline, starting with a 1947 classic album by pianist Thelonious Monk, and progressing to one of Blue Note’s most current releases, Landmarks, by Brian Blade & the Fellowship Band. The catalogue of artists and the album section are divided between the Blue Note “Safekeepers” (including Art Taylor, Bobby Hutcherson, Cecil Taylor, Eliane Elias, and Herbie Hancock), the “Groove” collective (e.g., Dizzy Gillespie, Anita Baker, Bobbi Humphrey and Alphonse Mouzon) and the vocalists (the likes of Al Green, Bobby McFerrin, Lena Horne, Casandra Wilson and Norah Jones). 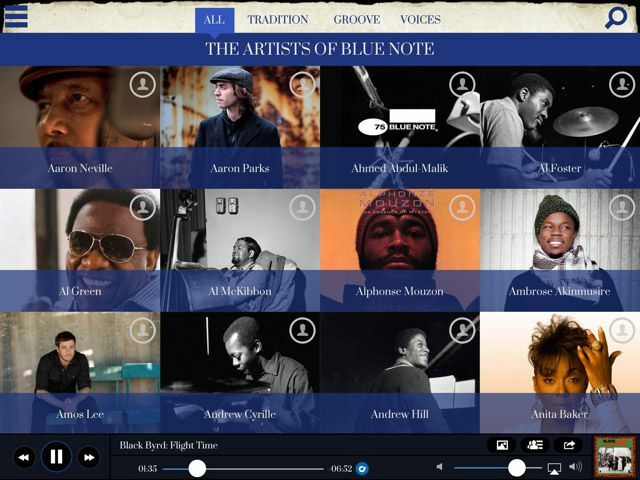 The Blue Note 75 app compliments the content found on the BlueNote.com website. This includes video interviews, jazz concert highlights, and spotlights of contemporary artists. 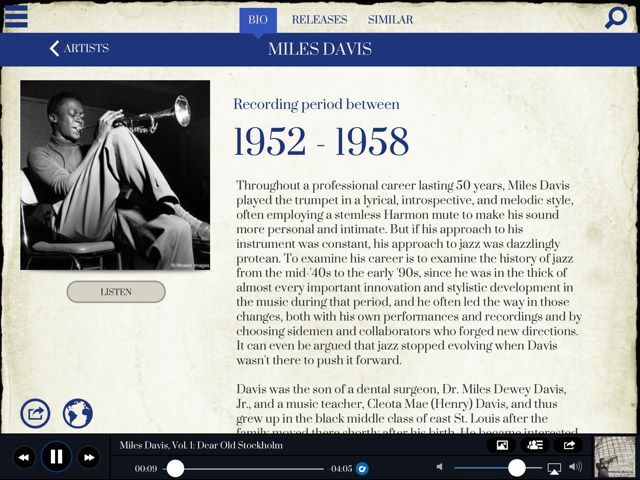 While the website is good, the iPad app is a better way to listen and explore the music of Blue Note, particularly when paired with a premium streaming music subscription. Do you like jazz? Let us know what you think of Blue Note 75 in the comments.